We need used single screw PVC pipe machine having 100 KG capacity and can produce 2 to 6 inches pipe. For sale UPVC pipe plant having 180 KG per hour production capacity. Make - Kabra. Size - 1/2 inch to 8 inch pipe. Year - 2008. We require PVC pipe making machine. It should have 65 MM extruder and having 50 to 60 KG per hour output capacity. We wish to purchase used Windsor KTS 200 / 250 PVC pipe making machine. We need plastic extruder with necessary equipment. 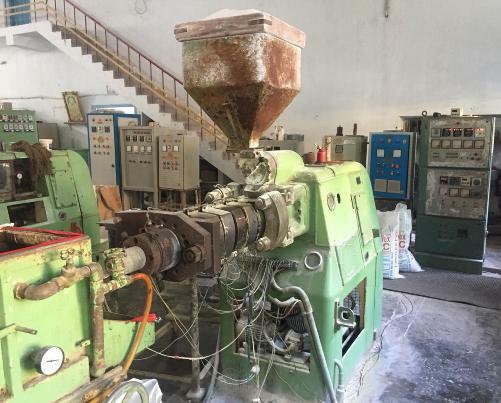 We have a complete PVC conduit pipe extrusion plant in full working condition for sale. It is app. 15 years old machine. It has 55 - 60 KG per hour production capacity. I require 20 mm to 110 mm rigid PVC pipe making machine. Please send me single screw and twin screw extruder line details. We wish to buy PVC pipe manufacturing plant 19 mm to 125 mm. Bore 50 mm to 75 mm. Per hour production capacity should be 40 KG.